Don't Let Sinus Pain Ruin Your Life. ENT Care by the Doctor, Himself, Every Visit! Dr. Kevin Browne believes in the sole medical practitioner approach to patient care. The San Antonio Sinus Philosophy of Treatment is Patients First! Sinus Pressure. Congestion. Swelling. Pain. If you suffer from the chronic conditions of stuffy nose, aching head, bad breath, and incessant coughing, it may be time to be evaluated by an ENT for serious sinus infection. Our office welcomes patients of all ages. We evaluate your symptoms to find out if you're a candidate for a procedure called Balloon Sinus Dilation, which greatly reduces the suffering experienced by chronic sinusitis patients. The individual medical attention that you need is always provided personally by Dr. Browne, San Antonio’s premier, board-certified Otolaryngologist. Our office is ready to assist with your ear, nose and throat needs. Recurring sinus infections can significantly reduce your quality of life and compromise your ability to function day to day. Are you suffering from acute sinus symptoms, recurrent episodes of sinusitis, or chronic sinus infections? Do you have sinus pressure and pain, headaches, postnasal drainage, coughing or fatigue? Don’t put off getting the relief you need! You can call today for an appointment with Dr. Kevin Browne, our ENT specialist at San Antonio Sinus, to find a solution. He will determine the real cause of your sinus problems and will work with you to develop the best treatment for your symptoms, your body, and your lifestyle. At San Antonio Sinus, Dr. Browne provides personalized, advanced sinus and ENT care. 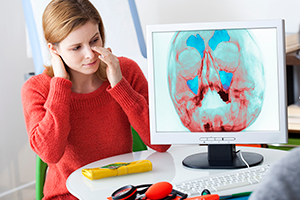 We use the most innovative techniques that include in-office sinus treatments as well as point of care CT evaluation of the sinuses. Dr. Browne’s goal is to care for your Ear Nose and Throat needs with the best medical approach or surgical treatment combined with a quality patient experience. If you've had a runny, stuffy nose, congestion, coughing, fatigue, and sinus pressure behind your eyes and cheeks, and these symptoms last for more than twelve weeks or continue to recur, you may be experiencing chronic sinusitis, a problem for 30 million Americans. Find out if you're a candidate for a procedure called Balloon Sinus Dilation which greatly reduces the suffering experienced by chronic sinusitis patients. Yes! I want to evaluate my sinus symptoms! San Antonio Sinus Offers Relief from Sinus Misery! If you’re suffering from a sinus headache, sinus pain or sinus infection, contact us today. Dr. Browne can begin the diagnostic process to find the cause of the problem and design the right treatment plan for you. Dr. Browne truly cares for his patients. From my first visit to my surgery yesterday, I was confident that he cared and he was focused on successfully fixing my problem. I had a deviated septum and Doctor Browne immediately told me he could help. I scheduled my surgery three weeks later and one day after surgery, I feel minimal discomfort and little pain. I will recommend Dr. Browne everyday!